PARK(ing) Day is an annual, worldwide event that invites city dwellers everywhere to transform metered parking spots into temporary parks for the public good. In the 21st century PARK(ing) Day started in San Francisco in 2005. Parking day occurs for one day a year. But long before this in the first half of the 20th century Parking day was an everyday experience. 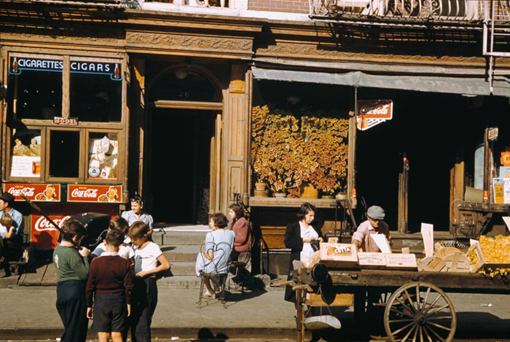 In this photograph from 1941 we see children gathering in a parking spot, a pushcart in the parking spot to their immediate right and on the sidewalk chairs where adults would gather to chat. As Park(ing) Day has shown there is no God-given right for internal combustion engine vehicles to be the only objects that can occupy a parking spot. PARK(ing) Day's curbside parks show that this can be done for a day a year. Park Chelsea intends to show this can be done for 365 days a year. As the New York City Department of Transportation has converted roadways into seating plazas, we can convert curbside parking spots into curbside parks with REAL grass, flowers. hummingbirds, fireflies, butterflies, seating and other park amenities. By trading several curbside parking spots on each block of Chelsea for curbside parks, Park Chelsea intends to go far beyond NYC Plan 2030 goal of placing a park within a 10 minute walk of every resident of New York and reach a goal of a curbside park within a two to three minutes walk of every resident of Chelsea. 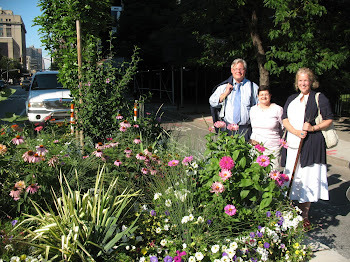 The Chelsea Garden Club consists of gardens created by as a side effect of trading car roadway for bike paths.